During menopause, a woman may start to be affected by a number of menopausal symptoms, which are caused by hormonal imbalances and are very normal for a woman going through menopause. However, they can still be unpleasant and can interfere with daily life. Mood swings are manageable, and making adjustments in lifestyle is the first step. Continue reading to learn about some techniques to keep mood swings under control. Stress can not only trigger a mood swing episode, but it can also cause episodes to occur more frequently or severely. Many other symptoms of menopause can create stress and discomfort, like hot flashes or vaginal dryness. Nonetheless, there are things that can be done to help reduce both stress and mood swings, such as changing certain lifestyle habits. Read on to learn about three things you can do to improve your mood swings and decrease stress. It may be easier said than done, but you should try not to let your mood swings control you and your life. Next time you feel like a mood swing is overcoming you, try counting to ten while taking deep breaths, and keep reminding yourself that you are in control. Other breathing techniques like this can help reduce stress and avoid the onset of a mood swing episode. Mood swings can often be taken out on whoever is closest to you at the time. However, misdirected emotions can increase the frequency of or worsen your mood swings. If you get the urge to shout at the nearest person, remind yourself that you are experiencing a symptom of menopause. When irritability comes up suddenly, try to excuse yourself and take a moment alone to cool off. It can help preserve both personal and professional relationships. Not getting sufficient sleep increases the frequency and severity of mood swing episodes. Sleep is vital for your overall health as well as in the battle against mood swings and any other menopausal symptoms. In addition, lack of sleep threatens the immune system and can lead to other stress-related illnesses. You should try to get between seven and eight hours sleep every night. This will leave you feeling recharged and more able to cope with everyday stress as well as menopausal symptoms. While mood swings can be frustrating, like all menopause symptoms, they can be managed and treated. 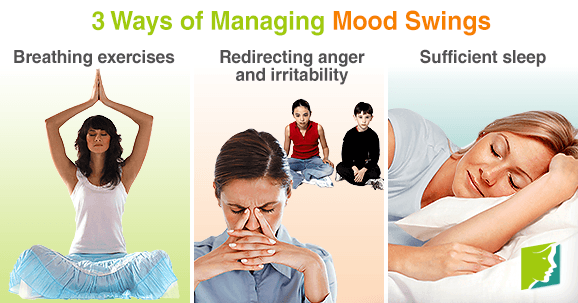 Click on the following links to learn more about mood swing treatments.